The term “linear” means that a scale is used to describe the biological range of each of the traits. That scale ranges from 0-50 for each trait. With the exception of stature and rump width, a linear trait score is an observation made by a trained appraiser rather than an actual measurement. Traits are evaluated by the appraiser without regard for age, stage of lactation, farm management or environmental conditions. The biological traits used in the linear appraisal program are believed to have economic importance either in terms of increased longevity, which reduces culling rate, or increased production. The traits exhibit enough variation to provide a basis for selection in breeding decisions. When a breeder has become familiar with the linear appraisal system, it is possible to get a visualization or “mental picture” of an animal based entirely on examining the linear scores. Many of us use photographs to help us consider and choose animals we may wish to utilize in a breeding program. However, for a number of reasons, photographs may not provide the accurate, unbiased picture we are seeking. The linear appraisal program does not set a certain point on a range of points on the scale for a linear trait as “ideal,” nor are more points, fewer points, or midpoint on the range for a trait necessarily more desirable. The program is designed, instead, to objectively assess the condition of a trait that a sire passes on to his offspring. To provide an example of how this visualization might work, we will examine two udder traits: rear udder arch and teat placement. Rear udder arch (RUA) is evaluated by the appraiser as the shape at the top of the rear udder where the milk is carried. 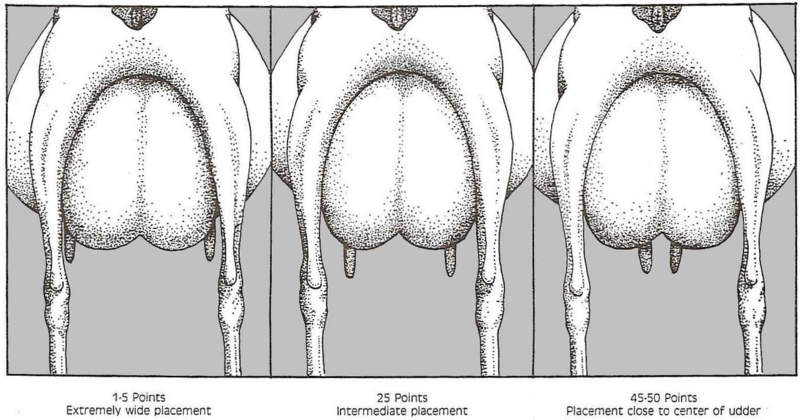 Teat placement (TP) is determined by observing where the center of the teat meets the udder floor. In evaluating the linear scores of your own animals, or, perhaps, those in the pedigree of an animal you are considering as a herd sire, it is important to know the range of the trait, the heritability of the trait, the breed average for the trait, and the trait scores of the animals you are considering as possible genetic resources. Table 1 illustrates the heritability of each trait. Each year, following the completion of all linear appraisal field sessions and data entry, ADGA publishes the breed averages for each of the linear traits. The age-adjusted breed averages for our example traits for does scored in 2013 are shown in Table 2. The age-adjusted breed averages for our example traits for does scored in 2013 are shown in Table 2. Calculating the range within two standard deviations would include 95% of all the animals scored. The information in Table 2 shows that for teat placement, the breed with the most variation in teat placement is LaMancha (SD=5.4;) the breeds with least variation in teat placement are Nigerian Dwarf and Nubian (SD=4.4.) Any ADGA-registered doe or buck evaluated in 2005 or later can be found by searching the ADGA Genetics website . Linear history documents each appraisal and provides the scores for all the linear traits. From our example above, an Alpine doe, Heidi, with teat placement of 12, has teats placed farther to the outside of the udder than more than 68% of all Alpine does scored in 2013. (Heidi’s teat placement score of 12 is more than one SD below the mean.) If we compare the trait score of 12 to the range illustrated in Figure 2, we can visualize the teat placement as being about midway between the lower end of the range and the midpoint. When looking at a buck’s type evaluation (not his own linear history) we can see the average scores of his daughters as well as the reliability of the scores. Reliability is based on the number of daughters appraised, number of appraisals, number of different herds and areas of the country where daughters were appraised. Bucks that have been used extensively will have higher reliability than those that are younger or have seen more limited use. Each of us has preferences regarding how we want our does to look. Prior to a linear appraisal session, each herd owner is provided with a document illustrating the range for each linear trait. Comparing your doe’s scores with the illustrations will give you a better understanding of where that animal falls within the range. Being able to “visualize” an animal based on the linear trait scores provides us with an objective, unbiased tool. The ability to visualize where we are and where we want to go in our breeding program with respect to the linear traits helps us make progress toward breeding a dairy goat that is sound and productive.